Style and simplicity collide with this chrome water bottle. Made of sturdy stainless-steel, this bottle ensures that your beverage stays cold, longer. This water bottle is perfect for the traveler or on-the-go friend with it's convenient handle and twist off top. 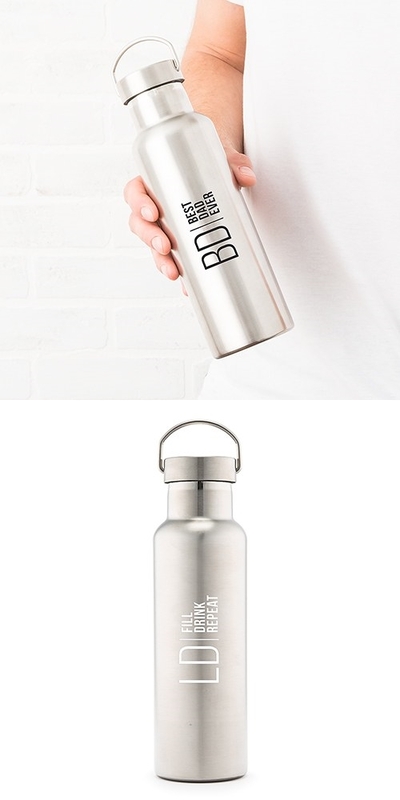 The stylish personalized design with two initials and three custom text lines in a contemporary vertical print (in black or white) is everything you need to finish off the look of this great stainless-steel water bottle. BPA-free. Recommended for cold beverages. Hand wash only.